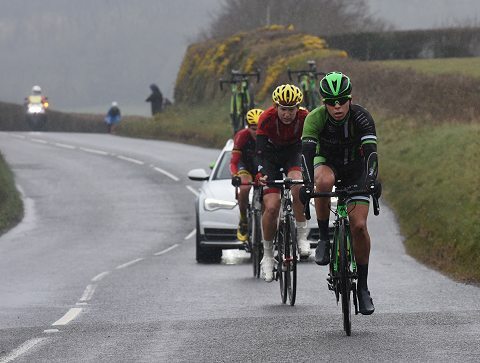 DEVON’S FORMER Team Sky star Jonathan Tiernan-Locke (Saint Piran) was pipped for Stage Three victory by Spaniard Albert Torres (Raleigh-GAC) in a gruelling finale to the Totnes-Vire Two-Day Race at Okehampton yesterday. 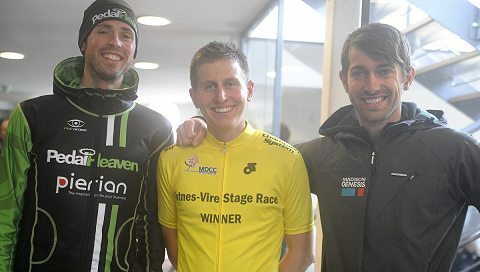 But it was Madison Genesis pro Matt Holmes, in second place overnight, who clinched the overall honours by finishing third behind Torres and Tiernan-Locke, making sure he lost no time to any of his serious rivals. First racing in a month and new signing for Raleigh GAC won his second stage making the final selection and outsprintingÂ Jon Tiernan-Locke and Matt Holmes (Madison Genesis) for the victory. 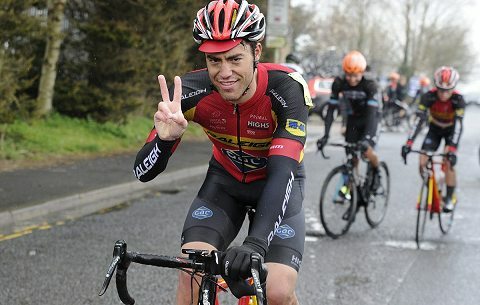 Albert Torres (Raleigh GAC) happy with his second win …. 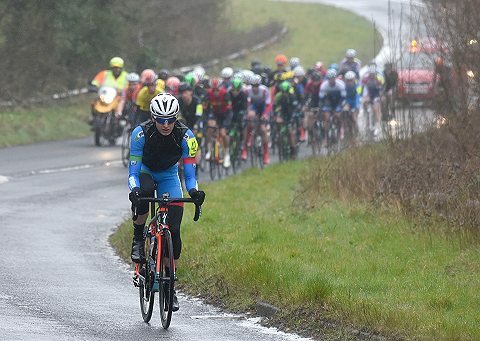 The final stage, over 112K of testing terrain between Okehampton, Sticklepath, Whiddon Down, North Tawton and back to Okehampton, was just coming to the boil, albeit in cold, wet and windy conditions, when the race had to be stopped on the third of four laps. Raleigh-GAC, the team of overnight leader Adria Moreno Sala, had controlled the peloton until an unrelated accident resulted in a trailer-load of chickens in crates blocking the road between North Tawton and Okehampton, just before the penultimate climb of Appledore Hill. 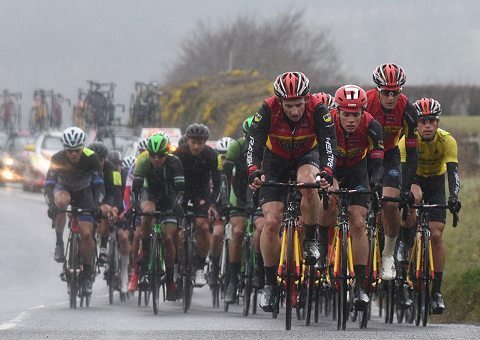 Some riders sought shelter in supporters’ cars, while others were offered coats to keep warm, until the road was cleared and officials restarted the race after a 20-minute delay. A three-man breakaway whose rider lineup changed during the race as riders were dropped and others came across. 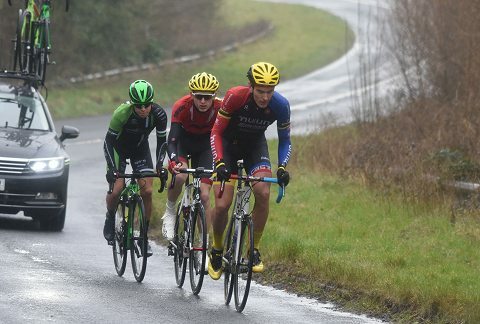 It escaped on lap 1 and Â which included Devon’s Dexter Hurlock (Kibosh), Mitchell Webber (Pedal Heaven). A spirited ride by 17-year-old junior Charlie Meredith (Giant CC-Halo Films), was finally chased down as the pace increased on the final lap. Tiernan-Locke, sixth overnight and needing to make up half-a-minute, had been showing his best form since returning from a two-year ‘biological passport’ ban, and he was bang there when it counted. But it was Torres, too far adrift overnight but a talented track rider, time trialist and sprinter, who beat him by barely a wheel in the final sprint. Lap 1 and a break was off and away, Mitch Webber (Pedal Heaven), Robert Moore (Sigma Sport) andÂ Luke Barfoot (Tri Uk). Holmes was third, Oliver Maxwell (Neon-Velo CT) fourth, Gruff Lewis (Madison Genesis) fifth and Dexter Gardias (Pedal Heaven) sixth, all given the same time.Â It meant that Holmes won overall in six hours 11mins from Paton and Holme’s teammate Lewis. Locke meanwhile was sixth, a frustrated man afterwards, and with good cause because he had lost 20 of those seconds during Saturday’s second stage, a 5K Time Trial at Halwill Junction. 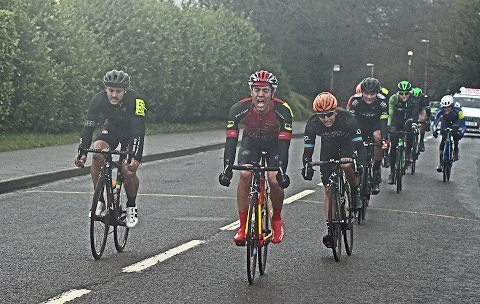 Raleigh GAC had Albert Torres and the team at the front behind the rider from PMR Toachim House.